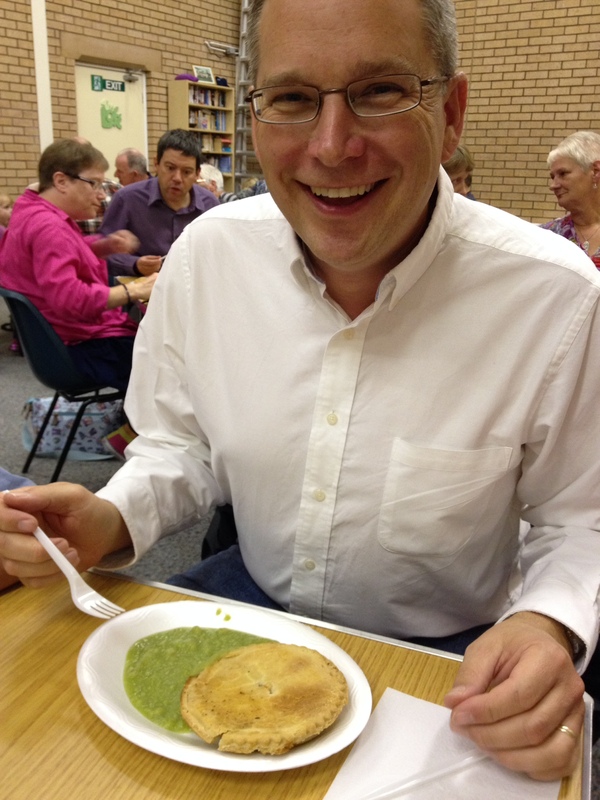 Meat Pies and Mushy Peas, it is what’s for dinner. Last night we were blessed by an opportunity to be with the wonderful people of Carrville Methodist Church. At Harvest Time each year, they celebrate as a church community by sharing a meal and playing games. We played quiz games like “Can you identify the person in this picture?” I didn’t do so well on the British Politicians and Athletes. Later they asked trivia questions on various topics. We did pretty well on the history and music portions. We failed miserably at trying to identify English sweets from written clues. I think I will have to eat more English sweets to round out my education. Afterwards came the Beetle Drive. This was new to us. What is a Beetle Drive? If you ever played the Milton Bradley game “Cootie,” you’ll be familiar with it. But how do you play with the 80 people we had last night? John W. Simpson describes it well in his book, Yearning for the Land: A Search for Homeland in Scotland and America. 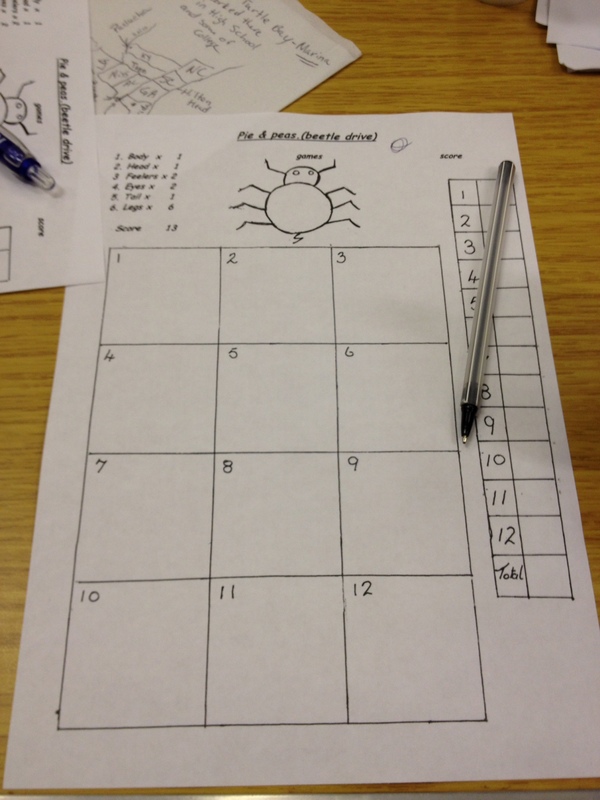 The Beetle Drive Score Sheet. Our new friend Mr. Ray (read about him in an earlier post) came out to be part of our family. Afterwards we walked to his cozy house for coffee and treats for the kids. He was proud to show us his VHS copy of his self-edited home movies of his vacation to Kentucky ten years ago. He was fun to see him so proud to show off his experiences to us. We have found the people of the Northeast to be very friendly and outgoing. They scoff at the idea that all the English are reserved, introverted, and stuffy. They tell me that is more typical of the people of the south of England. We are blessed to be a part of such a wonderful community and a part of a great group of people like those at Carrville Methodist Church. Quote from: Simpson, John W. Yearning for the Land: A Search for Homeland in Scotland and America. Random House Publishers, 2009. Wonderful to read about your great experiences! We miss you! Thank you! We miss you too!